Pressure washers help cut down the cleaning time, and they also come in handy when you want to get the walls ready before painting. With this cleaning tool, you can quickly get rid of mildew, dirt and dust without any hassles. 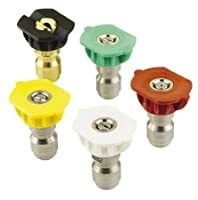 So, be sure to get yourself good quality pressure washer nozzles that can help you adjust water pressure just the way you want it. If you are in the market for excellent pressure washer nozzles that suit your needs, then the following brands are your best bet. Replace your worn and old pressure washer nozzles with this item Nozzle Model B4847GS by Briggs & Stratton. It works perfectly for pressure washers with a maximum PSI rating of 4000. This kit is equipped with 4 pieces of high-pressure spray tips that work for intensive to low pressure cleaning, also fit with other brands. From 0 to 40 degrees pressure tips, you can find the perfect one you need for efficient cleanup anytime! In need of a brand new pressure washer nozzle for your old one? If so, then this item is just what fits the bill. It features a quick-disconnect tip for easy removal when you want to switch from one spray tip to another. Just be sure to use it with your best pressure washer that comes with up to 4000 PSI rating. With this brand of nozzle for pressure washers, you can have an easier time during your cleaning jobs. When it comes to easy cleanups, what you need is a good brand of nozzle for your pressure nozzle. This product is equipped with 5 different nozzle tips that work perfectly with pressure washers from 1500, 2000, 2500 to 3000 PSI rating. In addition, this item comes with a nozzle tip made of the finest stainless steel material for optimum durability. With spray angles from 0, 15, 25, 40 up to 60 degrees, you will have a more convenient time tidying up whether it is light to heavy duty cleaning task. Tired of using your old pressure washer nozzle? Time to switch to this brand of spray nozzle by AR North America. This product lets you choose from different degrees for the water pressure, and you will find it quite easy connecting each nozzle with its quick-connect design. One word of advice – just be sure to use the right nozzle size for your washer to avoid any inconveniences or issues. 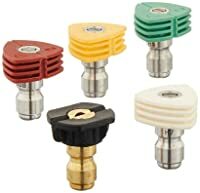 If you need a high quality replacement nozzle for your pressure washer, then this product is the right choice for you. These nozzles by Karcher offer a nice and even spray, which is just perfect for a more efficient cleanup without wasting much water. What’s more, this product is made of durable materials, so you can expect it to last for a considerable amount of time. So, make the right choice and go for this brand that gives a bang for the buck. Make your choice now from these top rated pressure washer nozzles brands and expect to receive the best value for your money!